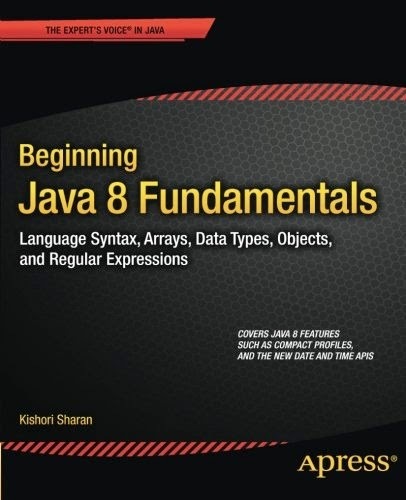 Beginning Java 8 Fundamentals provides a comprehensive approach to learning the Java programming language, especially the object-oriented fundamentals necessary at all levels of Java development. Author Kishori Sharan provides over 90 diagrams and 240 complete programs to help beginners and intermediate level programmers learn the topics faster. Starting with basic programming concepts, the author walks you through writing your first Java program step-by-step. Armed with that practical experience, you'll be ready to learn the core of the Java language. The book continues with a series of foundation topics, including using data types, working with operators, and writing statements in Java. These basics lead onto the heart of the Java language: object-oriented programming. By learning topics such as classes, objects, interfaces, and inheritance you'll have a good understanding of Java's object-oriented model. The final collection of topics takes what you've learned and turns you into a real Java programmer. You'll see how to take the power of object-oriented programming and write programs that can handle errors and exceptions, process strings and dates, format data, and work with arrays to manipulate data. This book is for those who are new to Java programming, who may have some or even no prior programming experience.